1) Matrix multiplication scales/rotates/skews a geometric plane. This is useful when first learning about vectors: vectors go in, new ones come out. Unfortunately, this can lead to an over-reliance on geometric visualization. You probably don't think "Oh, I need the volume of a invitation-familysize-hunger prism!". With large matrices I don't think about 500-dimensional vectors, just data to be modified. 2) Matrix multiplication composes linear operations. This is the technically accurate definition: yes, matrix multiplication results in a new matrix that composes the original functions. However, sometimes the matrix being operated on is not a linear operation, but a set of vectors or data points. We need another intuition for what's happening. 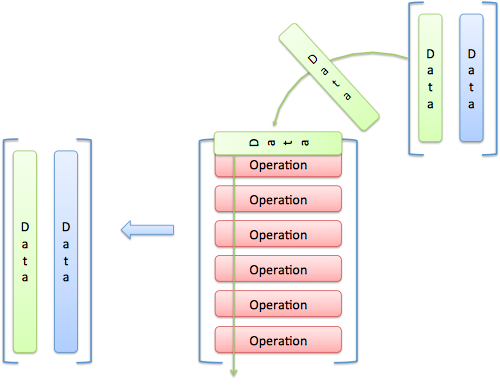 3) Matrix multiplication is about information flow, converting data to code and back. Take your favorite recipe. If you interpret the words as instructions, you'll end up with a pie, muffin, cake, etc. [3; 4; 5] means x = (3, 4, 5). Here, x is a vector of data (I'm using ; to separate each row). [3 4 5] means f(a, b, c) = 3a + 4b + 5c. This is a function taking three inputs and returning a single result. And the aha! moment: data is code, code is data! The row containing a horizontal function could really be three data points (each with a single element). The vertical column of data could really be three distinct functions, each taking a single parameter. Ah. This is getting neat: depending on the desired outcome, we can combine data and code in a different order. The matrix transpose swaps rows and columns. Here's what it means in practice. x' can still remain a data vector, but as three separate entries. The transpose "split it up". 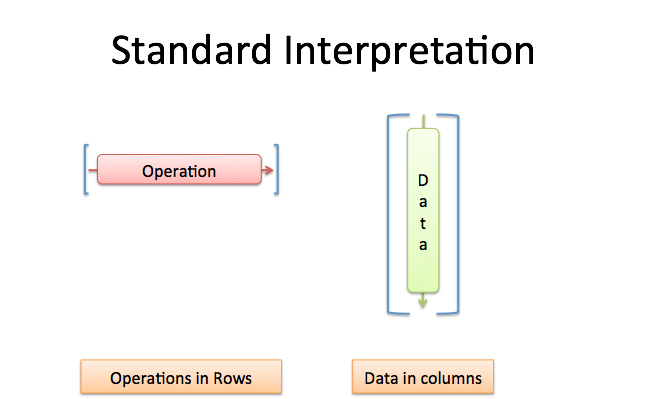 A single data vector, in a vertical column. f' is separated into three functions (each taking a single input). Let's use this in practice. When we see x' * x we mean: x' (as a single function) is working on x (a single vector). The result is the dot product (read more). In other words, we've applied the data to itself. When we see x * x' we mean x (as a set of functions) is working on x' (a set of individual data points). The result is a grid where we've applied each function to each data point. Here, we've mixed the data with itself in every possible permutation. I now have an instant feel of what's happening. In the first equation, we're treating $\theta$ (which is normally a set of data parameters) as a function, and passing in $x$ as an argument. This should give us a single value. can be worked through. In some cases it gets tricky because we store the data as rows (not columns) in the matrix, but now I have much better tools to follow along. You can start estimating when you'll get a single value, or when you'll get a "permutation grid" as a result. 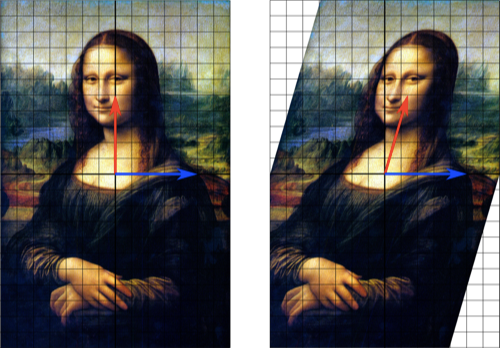 Geometric scaling and linear composition have their place, but here I want to think about information. "The information in x is becoming a function, and we're passing itself the a parameter." Long story short, don't get locked into a single intuition. Multiplication evolved from repeated addition, to scaling (decimals), to rotations (imaginary numbers), to "applying" one number to another (integrals), and so on. Why not the same for matrix multiplication? Appendix: What about the other combinations? You may be curious why we can't use the other combinations, like x x or x' x'. Simply put, the parameters don't line up: we'd have functions expecting 3 inputs only being passed a single parameter, or functions expecting single inputs getting passed 3. 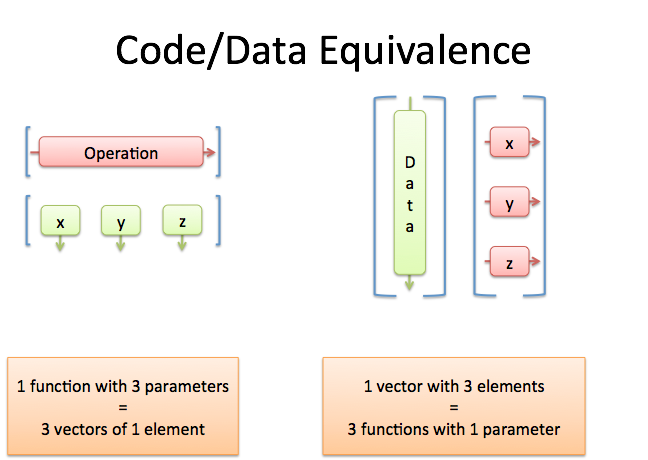 We define a function of 3 arguments and pass it the 3 parameters. This returns 50 (the dot product). Remember that [3 4 5] is the function and [3; 4; 5] or [3 4 5]' is how we'd write the data vector. I wanted to explain to myself — in plain English — why we wanted x' x and not the reverse. Now, in plain English: We're treating the information as a function, and passing the same info as the parameter.